Cuddling your pillow under soft sheets on a rainy afternoon while listening to the melodious tracks of Lovers EP will keep your melancholic heart at peace. 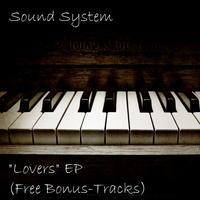 This album is a mix tape of love songs by Sound System, released in June 2013, following the album I’m Here in 2012. Lovers Snippet is the Mozart of all the broken hearts. The harmony of the piano will reverberate and go deep through your emotions. Despite having no lyrics to sing along to, you will find yourself humming along the melody. The solo starts of with a very slow pace, it then becomes intense at the middle part then again subsides in a soft tune at the end. A standout piece, Can’t Back Down is an R&B song that talks about not giving up on something that you really want. This song will indeed fire up your hopeless heart and will make you fighting for more in a single heartbeat. Ein Teil von mir, a love song sung in Deutsch is also included, making this album more intimate. This artist believes that no matter where people go, they must never forget the place where they came from; thus putting this track on this album. If you are the one who craves for a lullaby to put you to sleep, then Lovers EP is just the one that you need.